A court in Pakistan has sentenced two French journalists to six months in prison for violating visa regulations. 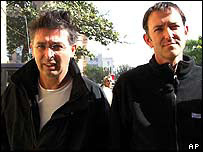 The two men, reporter Marc Epstein and photographer Jean Paul Guilloteau, from L'Express magazine were arrested by the Pakistani authorities last month. The trial judge ruled they had visited the south-western city of Quetta, near the Afghan border, without permission, also fining them $1,750 each. The prison term has been suspended for a week so lawyers can file for appeal. Police said the Frenchmen's visas only allowed travel to Islamabad, Lahore and Karachi. A Pakistani journalist who was working with the two reporters as a fixer, Khawar Mehdi Rizvi, was detained with them. The BBC's Zaffar Abbas in Islamabad says such harsh sentences against foreign journalists are rare in Pakistan. He says security officials there are alleging the two French journalists were trying to portray some local armed tribesmen as Taleban during their stay in Quetta in December, but the allegation was not raised in court. Soon after their arrest last month, President Pervez Musharraf criticised the two men and their Pakistani fixer for trying to defame the country by falsely presenting the country as a hub of Taleban activities. A petition by the lawyer acting for the two Frenchmen argued for the suspension of the jail term on the basis that they were "highly respectable journalists and not criminals". Although Pakistan has a liberal visa policy following some trouble in the border region with Afghanistan in recent months, it has imposed restrictions on foreign nationals from travelling in the area.